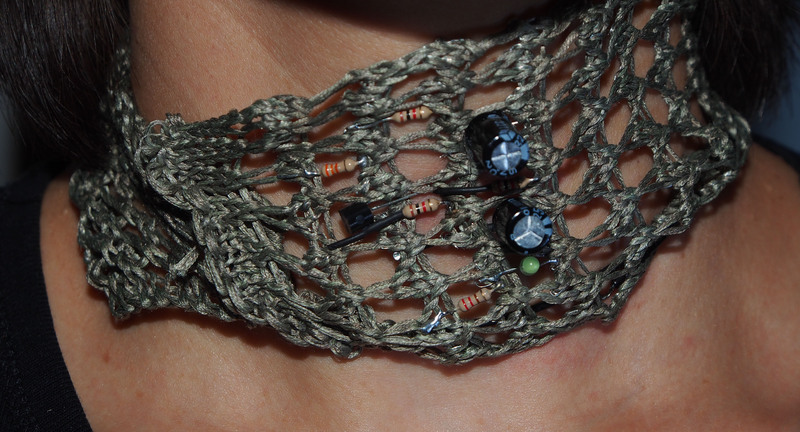 Machine-knitted lace circuit board. Components soldered by hand onto finished textile. The circuit creates a heart-beat-like pulse on the LED. 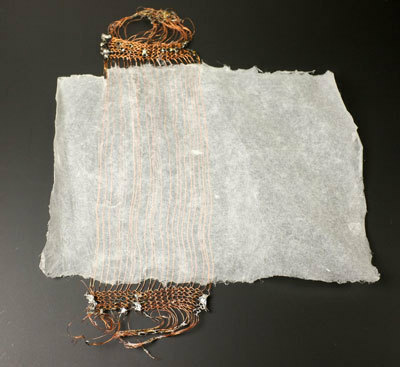 I'm developing a method to machine knit and solder copper wire, resulting in a flexible and conductive textile. Here are some of my test swatches, all knitted on my Brother 940 knitting machine in my new studio space. The swatches are knitted with 3 strands of 34 AWG wire, held together as a single strand. 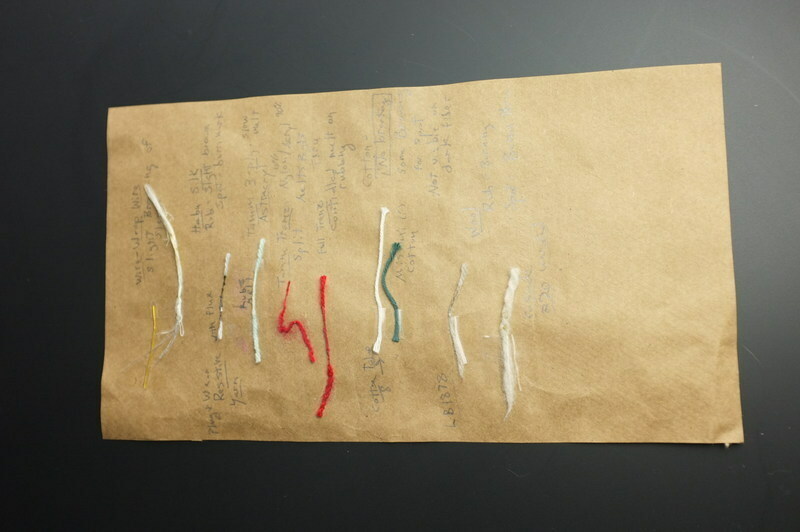 In order to mix non-conductive fibers with the wire, I've conducted heat tests on traditional yarns like acrylic, wool, silk, and cotton. 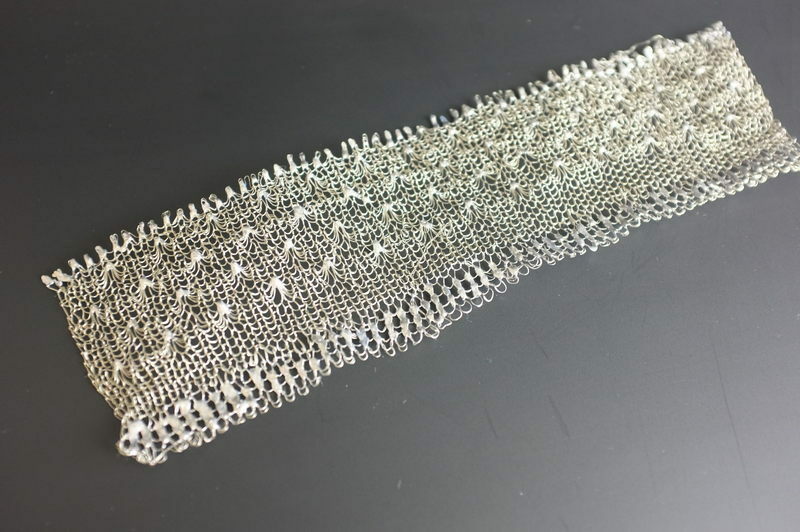 I'm interested in finding textiles that can withstand the heat of a soldering iron for the 2-3 seconds necessary to make a solid joint. So far, silk and cotton are the clear winners (and now I have a great excuse to buy luxury yarn!). I've been working on a design for simple, efficient speakers that can easily be embedded in textiles. Pictured are two of my working prototypes. The one above is knitted, and uses hand-made paper. The one below is a no-frills version that I'll use to illustrate the design concept here. 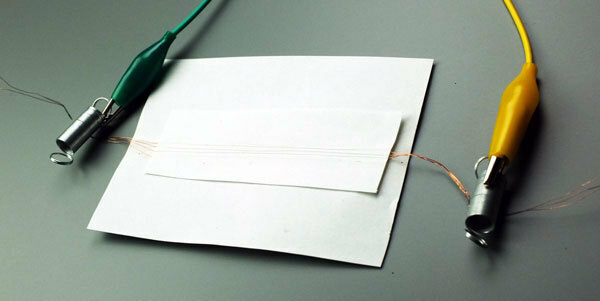 This speaker consists of four pieces of magnet wire, glued between two pieces of paper, positioned precisely over a magnet from a hard drive. The 4 pieces of wire are soldered together at both ends so that they carry audio signal from a small amplifier in parallel. The wires are placed just over the mid-section of the magnet. This creates an effective speaker because hard drive magnets are dipolar. 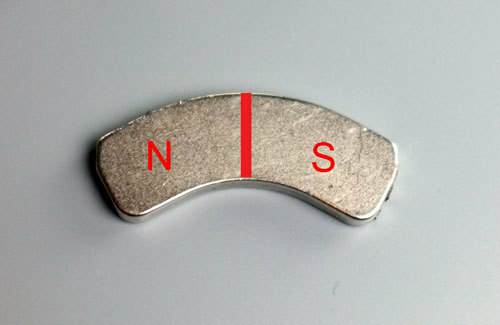 The broad face of the magnet has both a north and south pole. (Most bar magnets have just one pole per side, and aren't as effective for a flat speaker design.) Additionally, hard drive magnets are extremely strong. When the wire is placed directly over the boundary between the magnet's two poles (i.e. 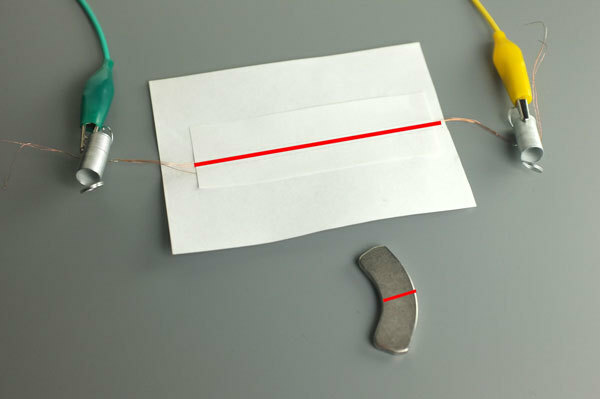 the red line on the paper rests on the red line on the magnet), it produces a clearly audible speaker. Electric current running through a copper wire produces an electromagnetic field. If this wire is placed in a magnetic field, it experiences physical force. The directions of the current, the magnetic field, and the physical force are all perpendicular to each other. A good way to remember this is Fleming’s left-hand rule, which uses your left hand as a mnemonic. The thumb, forefinger, and middle finger are held perpendicular to each other, forming an x, y, and z axis. 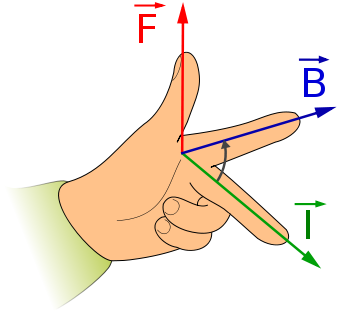 The first finger is the magnetic field (B), flowing from north (knuckles) to south (the fingertip). The middle finger is the electric current (I) traveling from positive (the knuckles) to negative (the fingertip). The thumb is the physical force (F), the direction the wire moves. 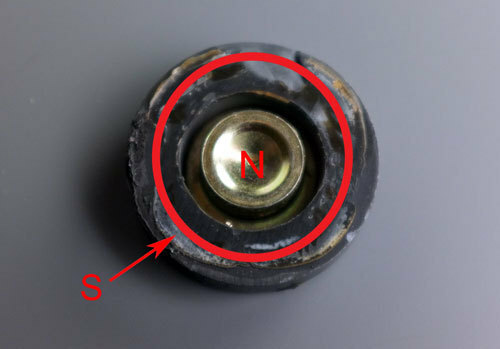 The coil of wire (“voice coil”) fits into a circular slot, the sides of which are a magnet. The middle piece is the north pole, and the outer ring is the south. So the magnetic fields run perpendicular through the coil, with the result that it pushes out, in the direction of the cone. Very efficient! A coil is great for speakers, but not particularly flat, as it sticks out perpendicular to the resonator. However, one piece of wire doesn’t move the paper very much. To increase the volume, I attached several pieces of wire, glued parallel to each other across the paper. I also sent the current running through the wires in parallel (this is very important for increasing volume). Now all the wires vibrate the paper in sync. My development of this design is on-going, and I am currently refining my knitting machine fabrication techniques. Stay tuned for more documentation. I make kinetic sculpture and sound art. I teach electronic art at Columbia College Chicago. Find my work at www.jesseseay.com.